Kineti L'Tziyon קנאתי לציון: You're Turning Me Into a Jew/Gentile! You're Turning Me Into a Jew/Gentile! Some amazingly great discussion going on over at Derek Leman's blog: Christian Missions to Jews and Post-Missionary Messianic Judaism, as well as Peter: Anti-Torah? The first post addresses an interesting point: In general, Christians want to convert Jews into Christians. Generally, they want Jews to drop the Torah and all forms of Jewish identity and have them become a member of the Christian community. It's this loss of Jewish identity that anti-missionary organizations like Jews for Judaism rant about. Orthodox Jews in Israel persecute Messianic Jews in part because they are not seen as Jews any longer, but instead as members of a foreign religion who've strayed from their Jewish identity, and thus, cannot be part of the ancient, historical, God-given Jewish state of Israel. "How important to God is continuing Jewish identity and how does your model of outreach handle identity?" How does the identity of being one of the descendants of Jacob get passed down? The Jewish answer for quite a long time has been simple: Jews marry Jews and raise their children as Jews. Is the answer of the Christian missions movement that this is no longer important? Does faith in the Jewish Messiah bring an end to the Jewish people? Should Jewish people assimilate into the larger Christian community and disappear? Should Jewish people who believe in Yeshua as the Jewish Messiah of Judaism assimilate into Christianity? "Your Jewish traits will be assimilated into the Church collective." Joking aside, this is a serious question. Should Jews who believe in Messiah lose their Jewish identity? And the reverse of this argument is that gentiles should lose their gentile identity and become practicing Jews, what of that? We must remember that before there were Jews, there were Hebrews. Abraham wasn’t Jewish, but he was a Hebrew: one who crossed over. We’re hearing Jews say they don’t want to turn into gentiles through belief in Messiah. And we’re hearing gentiles say they don’t want to turn into Jews through belief in Messiah. Maybe God’s intent is that we all cross over like Abraham did. If an act of “crossing over” for a Jew, today, is to accept Messiah, then perhaps an act of “crossing over” for a gentile is to enter into God’s commandments and his feasts and his rest. If either side just lives “as-is”, then we have lawless gentiles and Messiah-less Jews. Both parties need to act. This pointing the finger at each other, each telling the other what to do, is silly foolishness. I'd love to hear what you fine blog readers think. 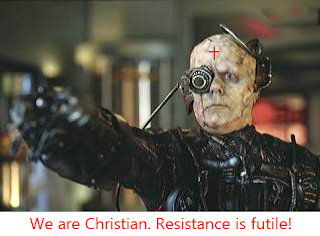 I'd especially like to hear from all you fine Borg Christian readers. * Hope you're not offended by the Borg stuff. It's good to laugh, even at oneself. I don't mean anything derogatory by it. Isn't it really about what God wants us to become instead of what we think the other should be? Personally, I don't think you should lose your cultural identity and neither should I. We can never be like each other anyway and I've learned, finally, that I'm really not to pattern myself after other believers but only after Christ. I've found that when Christians start trying to be completely alike it ends badly. God has called each of us right where we are to give Him glory. By that I mean that we give credit to Jesus for loving us where we were when He revealed Himself to us and His faithfulness to us from that moment forward. We give Him glory through obedience. We give Him glory when we treat others the way He treats us. It is much more than lip-service as seems the norm these days. Worship is so much more than singing songs and listening to a sermon. I think I've gotten side-tracked, sorry. What I'm trying to say is that God is diverse and human beings like uniformity. I prefer God's diversity and enjoy having fellowship with other believers that aren't like me at all. I learn a great deal from you, Judah and I think what you are doing is very important. I think most Christians (or at least, the ones in my circle) believe that what they believe is based upon the Hebrew faith but few really know anything about that faith or culture or how vastly different much of Christian theology is from the Jewish faith. Still, I don't think we can become Jews or glorify Him as Jews but only as Gentiles. I think we all need to be faithful to whatever God puts in our hearts to speak by the Holy Spirit to one another and leave the change in His hands. We are united in Christ and if we trade that in favor for complete doctrinal unity then we are united by a code rather than the person of Jesus Christ. The Christian walk is about each of us growing and becoming what God wants us to be through a close relationship with Him. Each of us is an unique work of God. We waste alot of time trying to clone Christians. Civilized debate is important though because that is the iron rubbing against iron that sharpens the whats of our faith that give us confidence in what we have been given to know about God and how He works. Even if we never completely agree, we are all edified by this process when our attitude is one of humility before God and one another. I have always found you to be a kind gentleman in these matters. Thank you for helping me to understand your culture and edifying my faith in the process. But to add to that, we have labels to describe ourselves and those labels come with expectations of belief and behavior. What's important is that people come to faith in Jesus/Yeshua and what He accomplished for us on the cross and what He accomplished in us through His resurrected life. Whether we come to that salvation as a Jew or a Gentile, we are all saved the same way. We give all we know about ourselves to all we know about Him. Our knowledge of ourselves isn't perfect and out knowledge of Him isn't perfect. To be sure, the Jew throughout history has had a relationship to and knowledge of God that the Gentiles were excluded from. But God has brought us all together in Christ in order to bring glory to Him. Through that union we learn from God and we learn from each other. Unity doesn't mean that we always agree, but that we bear with the weakness and ignorance of others realizing that it is only God that opens out eyes to His truth and in only in His time. The word ignorance has a bad connotation, but it simply means that we don't know something. When we come to faith in Christ we are all ignorant of just how depraved or flesh is and just how good God is. Praise God that he lifts that veil of ignorance in each of our lives. He shows us just how deeply sin is ingrained in our lives and he reveals to us a love and a grace that is sufficient for us in spite of our messed up humanness. It’s that love and grace that brings us to turn that rottenness over to Him in order to purge it from our lives and it’s that grace that allows us to bear up under the rottenness in the flesh of others. We realize that our battle isn’t against flesh and blood, but against sin…praise God that Jesus has already won that battle. Well I guess I rambled a bit as well. Get back on point, Gary! I feel confident that there are Christian’s out there that are trying to conform (assimilate) Jews into their notion of what a Christian looks like and acts like. But they are wrong to do so! It is God’s work to make us into the people He would have us to be and to use each of us to bring glory to Him; each in the uniqueness of our humanity. Where the Christian’s are right is the belief that everyone, including the Jew, needs to place their faith in Jesus. This is accomplished in our lives by God’s power and God alone. He has given us the blessing of participating in this by the sharing of the gospel (good news). There is only one gospel that saves, both for the Jew and the Gentile! It is all the other junk we pile on top that that divides us. May it never be! Amen! Jesus, the common denominator of us all. All are equal in Christ. However, the Day of the Lord will come "like a thief." On that Day the heavens will disappear with a roar, the elements will melt and disintegrate, and the earth and everything in it will be burned up. Galatians 3:26 For in union with the Messiah, you are all children of God through this trusting faithfulness; 27 because as many of you as were immersed into the Messiah have clothed yourselves with the Messiah, in whom 28 there is neither Jew nor Gentile, neither slave nor freeman, neither male nor female; for in union with the Messiah Yeshua, you are all one. 29 Also, if you belong to the Messiah, you are seed of Avraham and heirs according to the promise. Instead, clothe yourselves with the Lord Yeshua the Messiah; and don't waste your time thinking about how to provide for the sinful desires of your old nature. So then, Christians have forgotten what the word 'Christian' actually means - "to be Christ-like" which in turn means to strive to do all He did according to His example, which is to keep the Commandments and embrace the Holy Days of God. The dragon was infuriated over the woman and went off to fight the rest of her children, those who obey God's Commandments and bear witness to Yeshua. This is when perseverance is needed on the part of God's people, those who observe His Commandments and exercise Yeshua's faithfulness. And of non-believing Jews: Before they "cross over", the veil must be removed. Which can only be removed in Messiah. unlike Moshe, who put a veil over his face, so that the people of Isra'el would not see the fading brightness come to an end. What is more, their minds were made stonelike; for to this day the same veil remains over them when they read the Old Covenant; it has not been unveiled, because only by the Messiah is the veil taken away. Yes, till today, whenever Moshe is read, a veil lies over their heart. not in crossing over, for they follow closely in Messiah's footsteps, and must always strive to be an ever better example of Messiah in them, so they may help and lead back their brothers and sisters in Christ who have been lead away of satan and the harlot. Also being that light for their Jewish brothers and sisters who yet wander in the dark...taking all who are willing by the hand and leading them through the Torah and to the revelation that Yahshua is indeed the Mashiach until which time He removes the veil which is held fast by years of pride, tradition and corrupted truths leading to blindness and dullness of hearing. the people living in darkness have seen a Great Light; upon those living in the region, in the shadow of death, light has dawned." So in truth is anyone really "crossing over"? No, rather we who are elect and chosen will be restored to Messiah's image and do His will. For man's will is of no use at all (John 6:63...human power is of no use at all). Only the will of the Most High will be done. And His will is that we all become one in Messiah and walk in His ways... a Messianic Community... no walls, only the the Body of Messiah - The Light of Life. John 17:20 "I pray not only for these, but also for those who will trust in Me because of their word, 21 that they may all be one. Just as You, Father, are united with Me and I with You, I pray that they may be united with Us, so that the world may believe that You sent Me. 22 The glory which You have given to Me, I have given to them; so that they may be one, just as We are one -- 23 I united with them and You with Me, so that they may be completely one, and the world thus realize that You sent Me, and that you have loved them just as You have loved Me. "Brother, in that day we will be neither Jew, nor gentile, but one in Messiah...("God does not play favorites" ~ Acts 10:34)"
Timothy, so you believe that Jews will no longer be Jews when Messiah comes, and Gentiles will no longer be Gentiles but will just form one nationless group of people with no distinctions between us? Is that correct? Do you believe that nothing will identify one person as being of the seed of Jacob and nation of Israel, that G-d will erase all distinctions between Jews and Gentiles? How does that stand in the light of Jeremiah 31:36 "If this fixed order departs From before Me," declares the LORD, "Then the OFFSPRING of ISRAEL also will cease From being a NATION before Me FOREVER." The above tells ME that Israel will not only continue to exist, but will be composed specifically of descendants of Jacob and will never cease to be a distinct NATION before G-d, FOREVER. "In those days ten men from all languages and nations will take firm hold of one Jew by the hem of his robe and say, `Let us go with you, because we have heard that God is with you.'" Zechariah 9:23. 2) People will still have their own nationalities and will still live in their own nations. 3) Jews will still be Jews, will still chosen by G-d to represent Him, and will be sought out en mass by other the people of other nations because the G-d of Israel will live among them. prophecies on your site. Your prophecies seem to be of very general nature and one thing I noticed, many, unlike most prophecies in the Bible, do not address Jewish people much (as if they are an afterthought in G-d's mind). Why is that? Also, one your site, you write "To the Jews, the Law was given as a rod by which to govern themselves and obey...the old covenant of outward obedience, which led them into sin because of man’s tendency to break the Law". You are promoting the classic Christian idea that all G-d wanted of Israel is outward obedience, without the spirit. G-d has never rewarded outward obedience - he ALWAYS looked at the heart. You also write: "We, as Christians, have entered into a better and greater covenant, no longer bound by the old covenant which was outward obedience and manifest in the flesh by circumcision." Let's not forget that it is with ISRAEL that G-d has entered into the New Covenant. The Old Covenant with Israel has not been destroyed - just as the Covenant with Noah is still in place (otherwise, one might say that G-d is not free to flood the Earth again!) - one Covenant is built upon another. After lengthy debate, Kefa got up and said to them, "Brothers, you yourselves know that a good while back, God chose me from among you to be the one by whose mouth the Goyim should hear the message of the Good News and come to trust. that is, he made NO DISTINCTION between us and them, but cleansed their heart by trust. So why are you putting God to the test now by placing a yoke on the neck of the talmidim which neither our fathers nor we have had the strength to bear? No, it is through the love and kindness of the Lord Yeshua that we trust and are delivered-and it's the SAME with them." since everyone who calls on the name of ADONAI will be delivered. TRULY MESSIAH MAKES US ONE IN HIMSELF. AMEN. Is not color-blindness also part of the new eyes we receive in Him? Thanks for visiting, thanks for the debates. Here are some good ones for you, this time between 2 Jews. Yeshua did NOT come to this world(in human form) to begin a new religion. ! 'Achi, for those who find the "old testament" and the prophets- foreign & not necessary, they will have a big surprise when they see Him as He TRULY is & not a white european, blue-eyed, goatie-wearing blond hippie man. Sorry, getting off the topic. If assimilation came through force, it would be clear how wrong it would be. But when it comes through "love", through 'concern' about the direction you're going-- when the beginning attempts of assimilation come through kind family members/friends, this 'achi, is where one must compare if that path matches with the one we/they are following. This post does not have adequate space for all I have to say on assimilation...& I will not take up much more time & space. Honestly, I haven't read many comments here, as I'm quite familiar that we are in the minority (for now). TNCH tells us one day we WILL see "eye to eye". This will be the beautifully pure unity the L-rd G-d spoke of .